The 2016 WPT Canadian Spring Champion: Seth Davies! 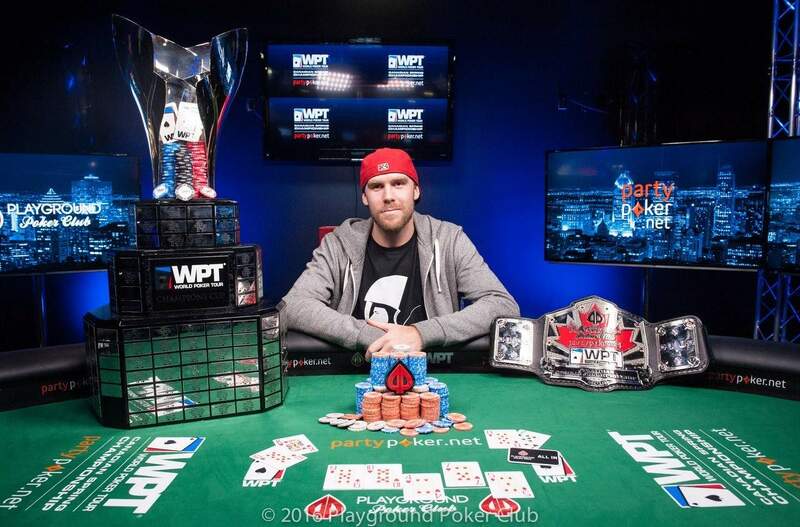 After about 43 hands of heads up play between competitors that saw the lead swing one way and then the other, Seth Davies has defeated Ruben Percival to emerge victorious in the partypoker.net WPT Canadian Spring Championship! After a long stretch of play during which the players had relatively even stacks, Ruben slowly started to accumulate chips until at one point he was the clear leader in the tournament – only to have the stacks return to about even when Seth hit a on the river to make bottom pair and take a big pot. They exchanged the lead a couple of times after that, but the general trend was in Seth’s favour – and eventually Seth had a 3-1 advantage and the clear momentum in the tournament. On the final hand of play, Seth raised to 275K and Ruben defended his blind – the players went to the flop. Ruben was first to act: check. Seth bet 375K and action returned to Ruben, who raised to 1.075M. With top pair/good kicker and back door flush possibilities, Seth made the call. The dealer set out the turn card. Ruben had just over a pot-sized bet left in his stack, and chose to lead out to 800K. Seth made the call. Ruben shoved – he was all in on the river… and Seth went into the tank. He was clearly feeling the pressure, required to make a hero call to potentially end the tournament – or to take a huge hit to his stack. Eventually, with a huge sigh, he made the correct call and with that, Seth Davies is our Champion! Benny Chen has done it again! 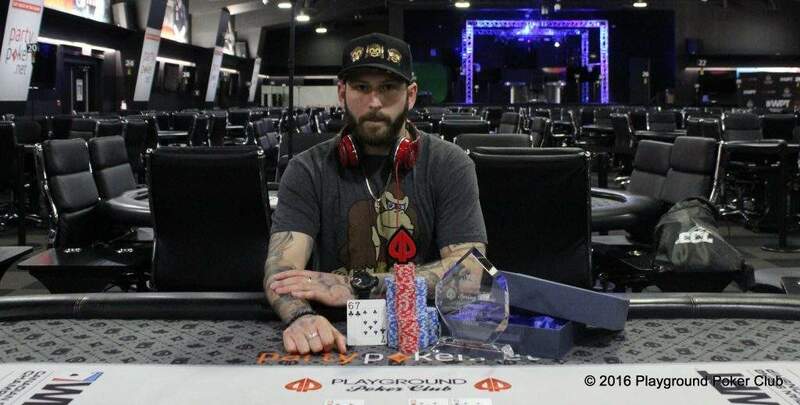 After besting a field of 136 players last November in Event 14 of the Playground Poker Spring Classic, which was the $1,500 + $150 Second Chance Event, he has put on a repeat performance and placed 1st out of 127 in this edition of The Second Chance. 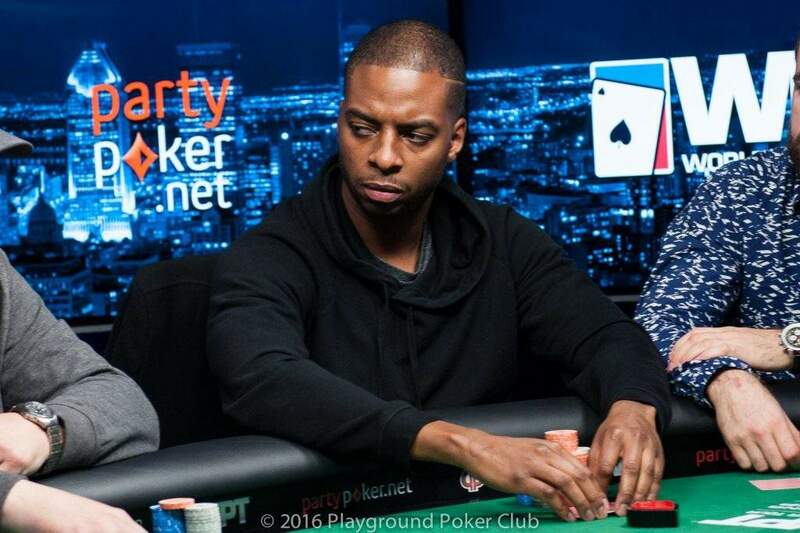 After 14 levels of play yesterday, the 127 player field in Event 14 of the Playground Poker Spring Classic was reduced to just 24 players, who returned today for the conclusion of this Second Chance Event. After starting the day second in chips, Benny didn’t see much change to his stack for the first few levels. He arrived at the table holding an average stack, and exploded after doubling up through Linda Huard. 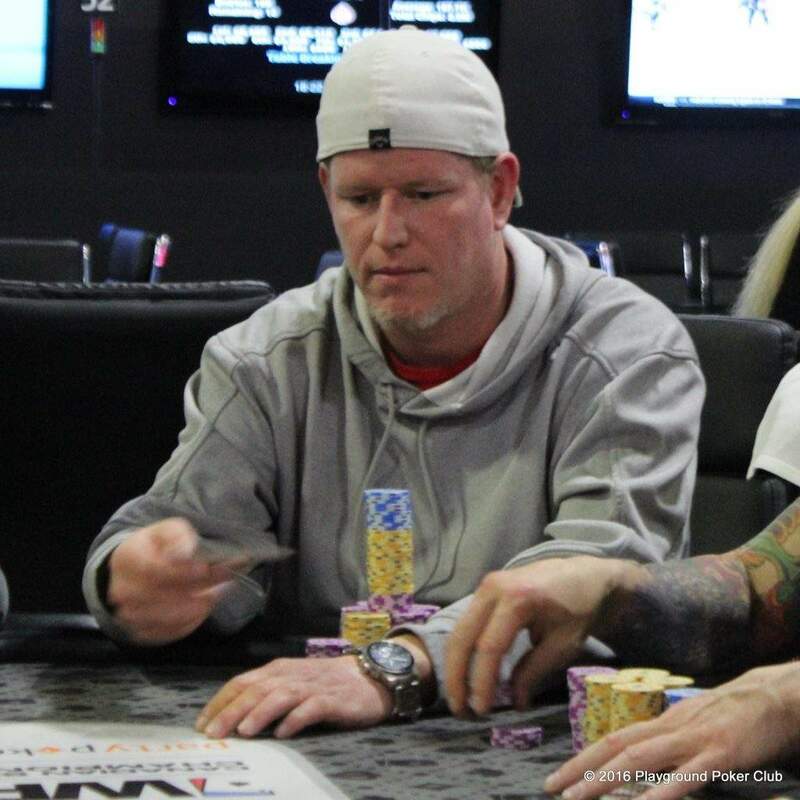 He took out Jason Helder in 5th place, and found himself tied for the chip-lead with Richard Edwin Mask once play fell 4-handed. After Ari Engel was eliminated in 4th place by Richard, Benny went on to knock out Paul El-Khoury to bring this event down to heads-up play. Heads-up between Benny and Richard started off quite even, as the players were within a big blind of one another, however it didn’t take long for Benny to chip away at his opponent. After seeing his stack cut by more than half, Richard found a much needed double up to bring the match back to even strength. Benny went back to work, and began chipping away at his opponent hand after hand. He rivered a straight and fired big to take a chunk out of Richard, and then won two back-to-back hands to bring him to victory. In the first hand, Benny called Richard’s 50K open preflop, and they both checked on the flop. When the turn brought the , Benny checked to Richard, who bet 65K. Benny raised it up to 150K, and Richard obliged. Benny fired another 150K on the river, and Richard made the call only to muck his hand once Benny showed for a straight. On the next hand, Benny asked to see Richards stack, who only had about 260K left – or 11bb. Benny open-shoved his button, and Richard called with . Benny tabled , and flopped the nut-straight for the win on a board, securing himself a second “Second Chance” victory! Benny collected almost $50K for the win, and is now the proud owner of TWO Second Chance Champion’s Trophies! Richard received a consolation prize of $34,680 for his runner-up finish. 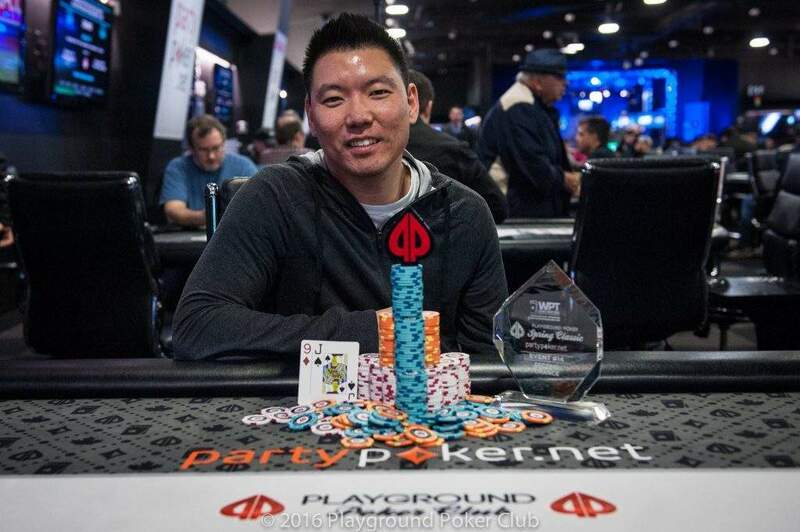 The road was long for Joey Boczek – with 230 players in the event, it took over 10 hours to play down to a champion in this final event in the Playground Poker Spring Classic presented by partypoker.net. Joey had a lead for most of the play on the final table and while he had some challenges, in many cases other players eliminated each other on the way to the championship. Even with blind levels being what they were and the deal in place, the final table still took quite a bit of time to play through and once play got heads up, energy was flagging. 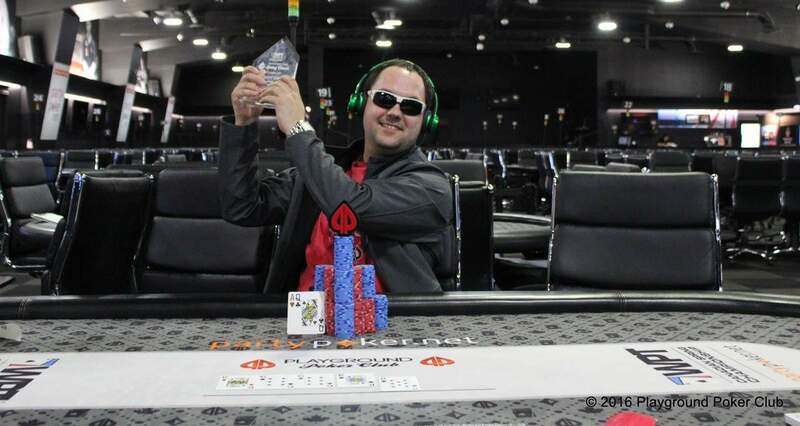 So, on the first hand of heads up play the chips found their way to the middle of the felt… and Birdman was able to win his first Championship in a Playground Poker Club festival event! Anyone how knows Joey will know what this means to him. 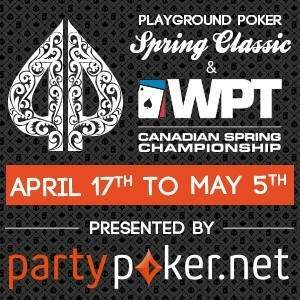 WPT Canadian Spring Championship Official Final Table! Play has concluded for Day 4 of the WPT Canadian Spring Championship as the field was whittled down from 16 to start the day to the 6 players remaining in contention for the biggest prizes in the event! Play will resume tomorrow – May 5th 2016 – at 12:00pm in level 26 (blinds 20K/40K/a5K) with most of the level left to play before blinds go up. Everyone still in the field is guaranteed to win a minimum of $51,400.00 – and the top prize is $256,390.00 – so there’s still a ton to play for tomorrow! 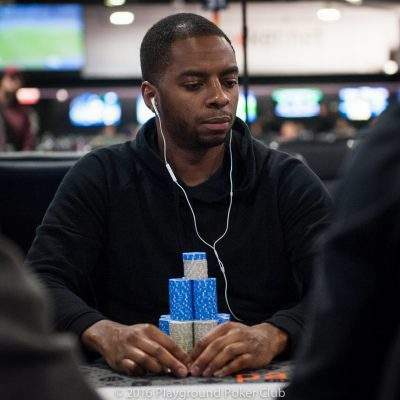 The chip leader to start the day will be Playground regular Ruben Perceval, who will begin with 4.395M in tournament chips – more than twice as much as his nearest competitor – but the table features a lot of very talented players, so even his chip advantage will in no way make a victory “easy” for Ruben. 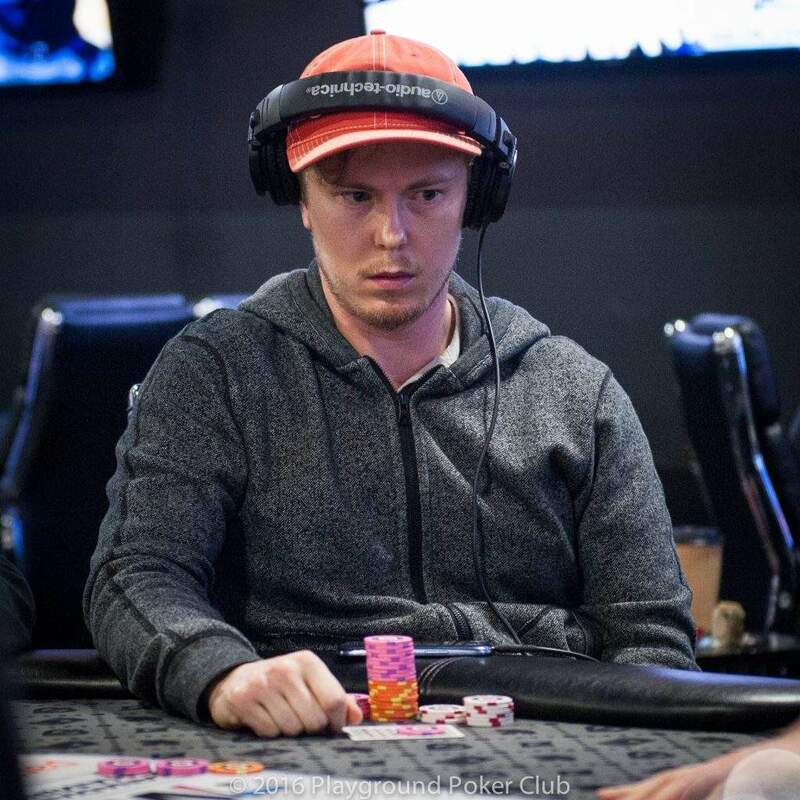 Second in chips is Seth Davies, known to many as Setherson2, who is a player with both live and online experience and who Montreal online master Carter Swidler certified as “really really good” in a conversation the other day. He’s a (recent) past SCOOP champion and has published live results dating back to 2010. 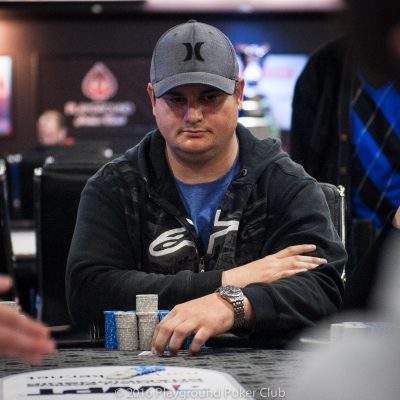 Third in chips will be Thomas Taylor, a player coming off a WSOP-C side event victory here in Montreal just a week ago and whose poker friends include all-world pro Mike Leah, among others. Thomas is also an accomplished online player and brings a wealth of experience to the table. 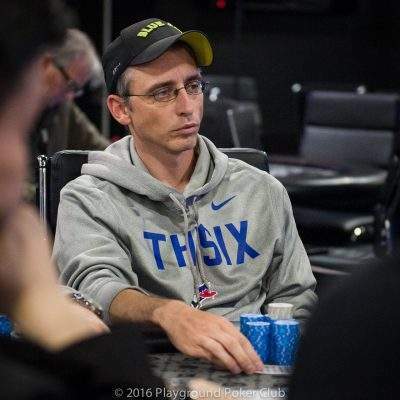 Fourth – less than 1bb behind Thomas – will be Tony Dunst, who is only one of the most recognizable names (and faces) in poker. As a partypoker Ambassador, TV analyst, Raw Deal host and the usual live stream commentator for WPT Events, millions of poker fans know and appreciate Tony’s hard work and insightful comments about the game. 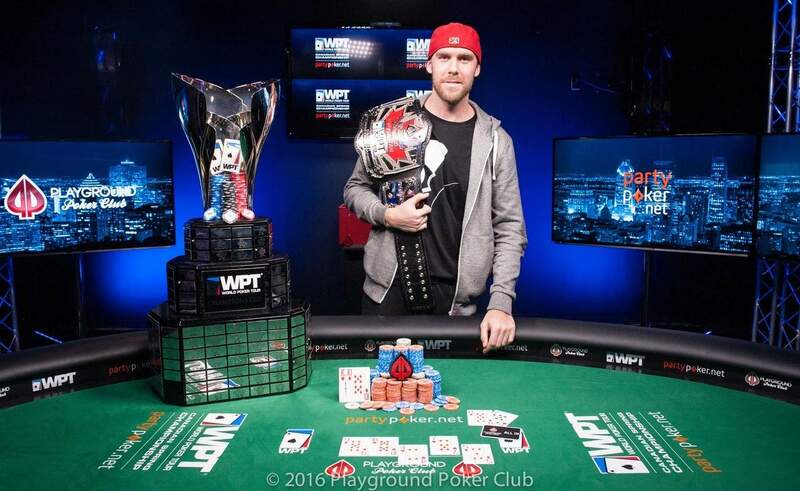 But never let it be forgotten that Tony is already a WPT Champion and has scores of live cashes – including quite a few victories – going back over a decade! 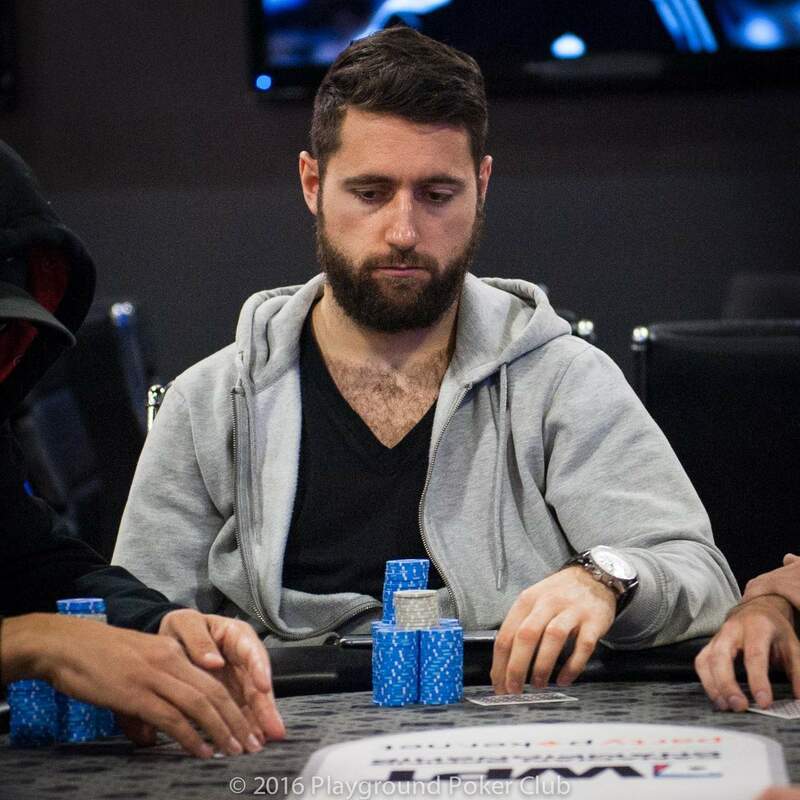 Fifth in chips to start the day is Joel Miller, who is a bit of a wild card in the field. 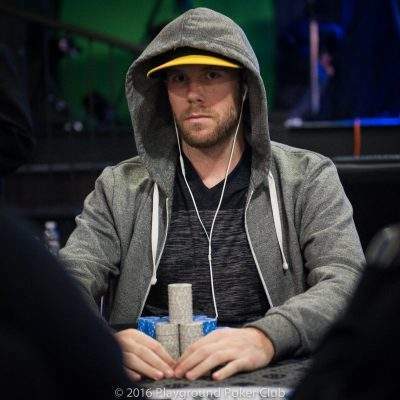 Joel has no published live or online cashes – but his play as the tournament has gotten deeper shows that he’s patient and has a solid understanding of the game at this level. Joel won a satellite league among friends to gain his entry in the event, and will have some railbirds on hand tomorrow. 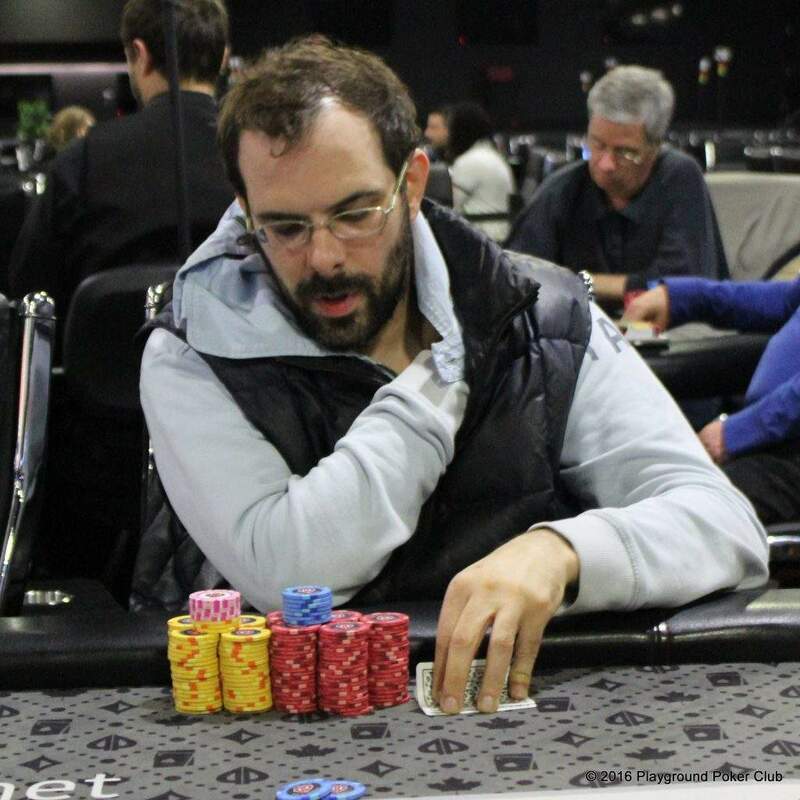 The “small” stack to start the day – though not that small – is Guillaume Nolet, another experienced player who is actually a repeat visitor to a WPT Final Table hosted at Playground Poker Club. 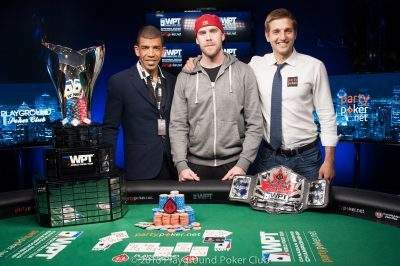 Guillaume was 6th in the 2014 WPT Montreal for the biggest live cash of his career. 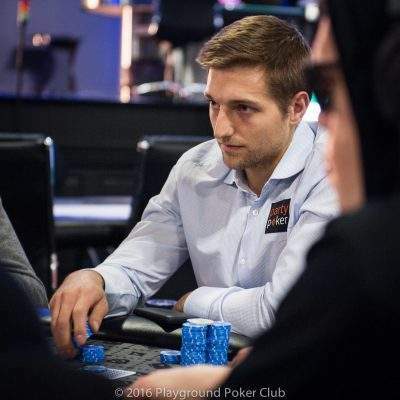 Where he really shines, however, is online – Guillaume was the winner of last years’s WCOOP Main Event for a payday of greater than US$1M. There were 109 players in Event 15 and the beginning of the tourney everything proceeded at a normal pace – but as the event got deeper, the quicker things started to move. At one point 3 tables broke in the space of just 30 minutes as the bubble approached. Once the final table arrived, there were several all in hands with no call and the small stacks doubled or at least increased their holdings for the most part. Then when the tournament got to heads up, both players were evenly matched in terms of chips. Again this time there was a passage of play with no movement… until David Guay shoved for 870K and found a call from Michael Stannard. Michael hit his King, but the turn and river runner-runner gave the pot to David and Michael had just 440K left. the very next hand he called off David’s all in with . But the runner runner turn and river gave David the pot – and the Championship!